By William Truswell, M.D., Jon Mendelsohn, M.D., Harrison C. Putman III, M.D., David Ellis, M.D., Neil A Gordon, M.D. William Truswell, M.D., Jon Mendelsohn, M.D., Harrison C. Putman III, M.D., David Ellis, M.D., Neil A Gordon, M.D. If you don’t, perhaps you’re considering cosmetic surgery. You’re thinking maybe a facelift would rejuvenate your appearance. Yet, you’re not sure what’s involved or whether cosmetic surgery is right for you. This book can help you explore the possibilities. What type of facelift would give me the best results? Should I consider other procedures such as an eyelid lift? Will I have post-surgical pain? Learn What Works, What Makes Sense, and What You Need to Know! 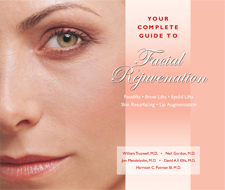 Your Complete Guide to Facial Rejuvenation contains 180 color photographs and illustrations. Glossary, Index, and Resource section. Harrison C. Putman III, M.D., F.A.C.S.